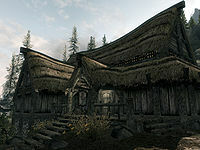 Braidwood Inn is an inn at the center of the small settlement of Kynesgrove. The inn was built next to the mine and serves as dining hall, shop and everything else for those who live in Kynesgrove. It not far due south of Windhelm, but the residents act like it's miles away from anywhere else. Iddra and her husband, Kjeld, run the inn together. However, Kjeld is more interested in the running of the mine and will buy any malachite ore you have. It only consists of one zone, which is the interior. * Kjeld will take over as innkeeper if Iddra is dead. The inn is set near Steamscorch Mine, which has a camp set up outside the inn consisting of three small tents with bed rolls in them around a central campfire. There are a couple of food barrels and a rack with nine salmon hanging from them. There are also a wood chopping block, a tanning rack and a small vegetable garden with ten cabbages, four gourds, six leeks and eight potato plants. Of all the items only the salmon are owned, and taking them is considered stealing. Next to the inn itself is a grindstone, plenty more barrels of foodstuffs and just down the road to the west is a chicken coop housing two chicken nests. There is a flight of steps up to the porch on the front of the inn, with a wooden bench just to the right of the entrance. 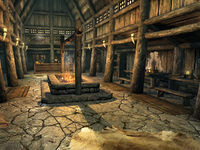 The front door of the inn, as with most in Skyrim, leads directly into the common room which consists of a central long fire pit with five long wooden tables and benches against the side walls and the counter at the far end. On the tables are a selection of bottles of alto wine and wine and a couple of loaves of bread, with the exception of the table in the southwestern corner which also has a couple of salmon steaks and several pieces of cheese. The room has three doorways off of it, two to the west and one to the east. On the counter is a bottle of alto wine, a bottle of wine, several pieces of cheese and two pine thrush eggs, while under the counter two bottles of alto wine, six bottles of wine, fourteen bottles of Nord mead, three small coin purses, a steel warhammer and five gold coins. Behind the counter, against the north wall are five large vats and several food barrels. In front of these are racks hanging from the ceiling holding eleven rabbits and six pheasants, with two garlic braids, a bunch of dried elves ear and a bunch of frost mirriam also hanging from the ceiling. Either side of the doorway to the east are sets of shelves that hold two bottles of alto wine, six bottles of wine, seven bottles of Nord mead, four loaves of bread and three bunches of elves ear. In the northwest corner, next to one of the vats is a flower basket holding two chicken's eggs and a pine thrush egg. The largest of the three bedrooms is the one to the east, it is also the one you are give and shown to if you rent a room at the inn. It contains a double bed coming out of the south wall with an empty unlocked long chest to the left, with a large coin purse hidden to the left of it, in the southeastern corner. Against the east wall are two dressers containing clothes and having a steel dagger, two bottles of alto wine, three bottles of Nord mead, a flute, a drum and a copy of the uncommon book Songs of Skyrim on top. To the right of the bed, in the southwestern corner is a small square wooden table and chair with a fancy bowl and goblet on the top of the table. Against the north wall are a pile of three food sacks. Opposite this bedroom are two more, with the left-hand one containing a single owned bed in the northwestern corner and a round wooden table and chair to the right of it. On the table is a bottle of Black-Briar mead and three common books. At the foot of the bed is an unlocked chest containing leveled items, with a tall wardrobe against the north wall. The right-hand room contains two single owned beds against the south wall, separated by an unlocked chest containing leveled items and a round wooden table and chair in the northwestern corner, with two common books on top. This is the merchandise found in the inn's merchant chest. These items are only available if purchased from either Iddra; they cannot be pickpocketed or stolen. They are restocked every two days. Iddra provides the inn's services, namely room rentals and food sales. If anything happens to Iddra, Kjeld will take over room rentals, but not merchant services (in the absence of Iddra, it is impossible to buy or sell items in Kynesgrove). Once you have helped Iddra by speaking to one of her customers the beds in the small bedrooms become free to use. Other than most barrels and sacks, all containers in the inn are non-respawning and safe to store items in. This page was last modified on 29 September 2016, at 10:52.